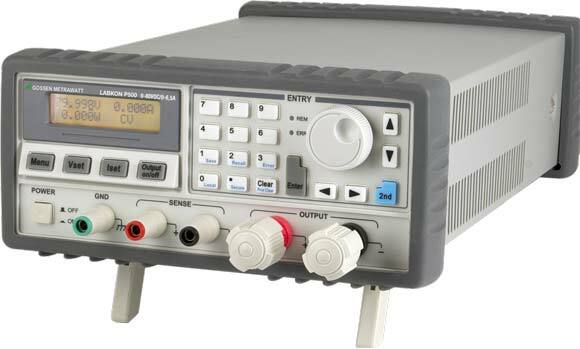 Computer controlled LABKON P series KONSTANTERs provide users with manually and remote controllable DC power supplies for laboratory and systems use. They’re distinguished by good dynamic response in the event of setpoint changes and sudden load changes. Rated nominal values can be continuously delivered thanks to the highly stable power output and can always be replicated thanks to precise digital setpoint entry, thus assuring reproducible results. The user can save individualized device configurations to the setup memory module and retrieve them as required. This ensures a time-saving device configuration procedure for recurring periodic tests. In addition to the RS 232 port included as standard equipment, USB and GPIB (IEEE 488) ports are also available as options. Furthermore, the use of an SCPI command set permits trouble-free integration into automated test systems. Several groups of parameters (device settings) can be saved and retrieved.